I first encountered the Bodie Hills on a visit to Bodie State Historic Park with my dad, sometime around 1970. We had already been visiting Yosemite for some years and I was completely in love with the central Sierra Nevada—the landscape, the geology, the plants and wildlife, the history. This first visit to the “east side” immediately expanded the scope of that interest to a much wider area. Me and a “stone boy” atop Mt. Biedeman, 1979. 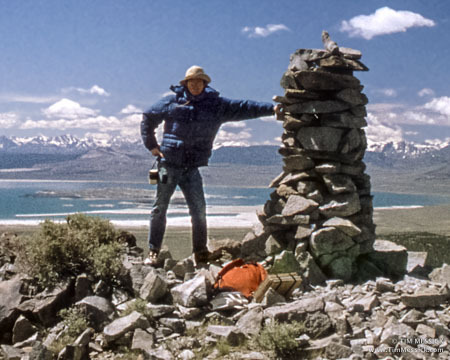 Later, as a Botany major at Humboldt State University, I looked for a place in the central or eastern Sierra Nevada where I could compile a local flora for my MA thesis. The Bodie Hills seemed a good place to look for interesting plants—the area had been collected some in the past, but not much. It offered a mix of Sierran and desert vegetation, over 4,000 feet of elevation change, and varied geology. Several rare plants were known from the area. So I spent the summers of 1979, ’80, and ’81 collecting plants throughout the Bodie Hills. I camped most nights a few miles west of Conway Summit, on Virginia Creek, listening to wind and hermit thrushes in the lodgepole pines while keying out the plants I had collected. Those were the days. Now, three decades later, the Bodie Hills are receiving many more visitors and recreational users than ever before. There is also more attention from public land management and conservation interests who want to protect and restore habitats in the Bodie Hills for wildlife, recreation, livestock grazing, and other sustainable uses. This seems a good time to dust off the old thesis, update the contents, and make it available, via the Internet, to anyone who is interested. The first edition of “Plants of the Bodie Hills: an Annotated Checklist” is an e-book in PDF format, available at the “Download” link at the top of this page. It is mainly a list of plants, alphabetical by family, with notes on where they occur in the Bodie Hills. Future editions may include keys, photographs, and other aids to identification. Meanwhile, I’ll be posting some drafts and other supplemental information here on the blog. Have you found something interesting in or near the Bodie Hills? I’d love to hear about it. Leave a comment on any post or go to my Contact page. Thanks for visiting! P.S. : My other passion is photography. Check out my photography site and my other blog to see more of that. Does Dune Horsebrush Occur in the Bodie Hills? Follow to receive emails about new posts. All photos, maps, and text are copyright Tim Messick 2015-2018, except where other sources are given credit. All rights reserved. No copying or modification without written permission. Links are welcome. Thanks!